"This really was an incredible and implausible victory. Adam Long's form figures since August read MC-MC-MC-MC-63-MC-MC-MC coming in to the event and the world number 417 was sitting 205th (out of 218) in the FedEx Cup standings." Having led through rounds one and two, pre-event [90.0] chance, Shane Lowry, who was matched at high of [100.0] before the off, entered the final round of the Abu Dhabi Championship with a three-stroke lead and he was matched at just [1.34] for the win but after a quite brilliant start to round four by South African outsider, Richard Sterne, who was matched at a high of [820.0] before the off, Lowry trailed by four strokes with just seven holes to play. Sterne was matched at a low of [1.07] before back-to-back birdies from Lowry at 12 and 13 closed the gap back to two and it really started to get interesting when Sterne three-putted the 14th to make bogey. A pair of pars followed at 15 before Sterne failed to get up-and-down for par at 16 but having drawn level with two to play, it looked like momentum had swung back in favour of the South African when Lowry missed the green badly on 17. Sterne looked set to regain the initiative but Lowry was having none of it and the pair went to the 18th tied after this quite brilliant up-and-down. In 13 previous renewals, we'd never witnessed a playoff and it soon became apparent that the run was going to continue after Lowry found the par five 18th green in two and Sterne's second shot finished way wide of the putting surface in a very awkward spot. Sterne was unable to get-up-and-down, Lowry tapped in for birdie and minutes later the Irishman revealed the inspiration for the sudden upsurge in form - the 2020 Ryder Cup. "It puts me to where my goal is for the next 18 months and that's to be on the plane to Wisconsin with Paddy. That's kinda where I want to be and this is a great stepping stone." Over at the Desert Classic, we witnessed another short-priced in-running defeat when Canada's Adam Hadwin's price dipped to [1.08] before he was caught and passed by pre-tournament [1000.0] shot, Adam Long. Phil Mickelson had began the fourth and final round two clear of the field and he was matched at a low of [1.69] in-running but an ice-cold putter hindered Lefty throughout the final round and when Hadwin stood over a five foot birdie putt on the 12th, that would have seen him go four clear with six to play, odds-on backers were filling their boots but it wasn't to be. Hadwin missed the tiddly birdie putt at the 12th and it killed his momentum completely. He bogeyed the next hole and parred his way in. Mickelson rallied well with back-to-back birdies at 15 and 16 but he narrowly missed a ten-footer for eagle at 16 and his birdie attempts at 17 and 18 both missed by the tiniest of margins. Rank outsider, Long, had looked out of the reckoning with seven to play but he birdied 12 and 14 before chipping in from the rough on 15 and he was still considered far and away the least likely winner as he, Mickelson and Hadwin played the last two holes, tied for the lead. 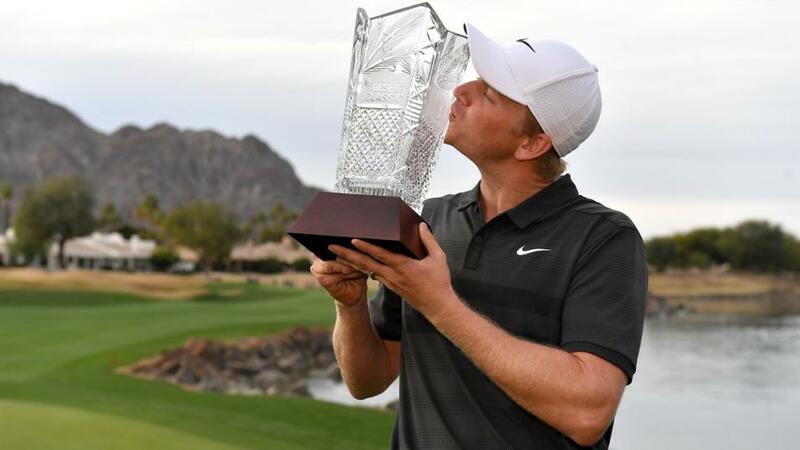 It was impossible not to admire his birdie at the 72nd hole to take the title but the highlight for me was the state of shock his wife, Emily, was in after he'd rolled in the 13-footer for the title. The reactions say it all for @ALongShot. This really was an incredible and implausible victory. Having qualified for the PGA Tour via the Web.com Tour, where he played 113 times without winning, Long was playing in just his sixth PGA tour event and he'd only once before made the cut on the PGA Tour, when he finished 63rd in the Safeway Open. His form figures since August, spanning the two tours read MC-MC-MC-MC-63-MC-MC-MC coming in to the event and the world number 417 was sitting 205th (out of 218) in the FedEx Cup standings. I didn't come close to picking either winner this week but laying Sterne at [1.2] after ten holes, before backing him back after 16, resulted in a profitable event in Abu Dhabi and a win for in-play pick, Mickelson, would have resulted in a nice little week but it wasn't to be. He took 33 putts on Sunday so he was always up against it. The Abu Dhabi Championship looked a tricky puzzle to solve and so it proved. With the vast majority of the field playing for the first time in a month, trying to work out who might or might not be in form was pure guesswork and, in the end, it was Ryder Cup inspiration that did the trick. Lowry was clearly well-prepared after the announcement that his good friend Padraig Harrington will captain the European side in 2020 but I'm not sure how any of us would have known that and it remains a tournament to be wary of before the off. To add to the confusion, Lowry was yet another winner with what can only be described as poor course form. He'd finished fourth on debut back in 2010, but he'd missed the cut three times after that and he hadn't played in the event for five years. Course appearances, rather than course form, seem to be important and nobody highlighted that better than Soren Kjeldsen, who finished fifth. The veteran Dane had played the event 12 times previously but his tied 24th on debut in 2006 was his best effort before this year. It's hard tournament to get to grips with. We've got a pair of cracking tournaments to look forward to this week - the Dubai Desert Classic on the European Tour and the Farmers Insurance Open on the PGA Tour - and I'll be back tonight or tomorrow with my previews.